The troubled Indian airline Jet Airways has failed to secure emergency funding from its lenders. The company, which last week suspended all international flights, has extended the cancellation period until Thursday. It was India’s second-largest airline by market share, until recently. But dozens of its planes have been seized by creditors, leaving the firm with only seven operational aircraft. 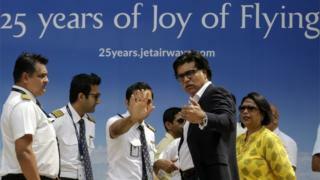 Chief executive Vinay Dube said Jet’s board would meet on Tuesday. Thousands of passengers have been stranded due to the firm’s lack of funds. Jet now has debts of more than $1.2bn (£900m). In a letter to staff, Mr Dube said that interim funding had “not been forthcoming thus far”. The airline was flying 600 domestic and 380 international routes. Pilots, engineers, and ground staff, who have not been paid since December, have said they will strike if the banks do not inject emergency funds. They had planned to strike from Monday, but postponed the action until after the bankers’ meeting. Jet Airways owes money to employees and suppliers and in recent weeks it has grounded aircraft and cancelled thousands of flights as its financial strains worsened. Last month, in an unusual move, the government stepped in and asked public sector banks to rescue the private carrier. India is in the midst of a national election, and the government did not want the airline to be grounded as that would have affected 23,000 jobs. A consortium of investors led by the State Bank of India (SBI) took control of the airline in March. The airline was founded by Naresh Goyal more than 25 years ago and he and his family currently own 52%, although that majority stake is expected to be lost as lenders’ restructure the debt. Jet is 24% owned by Etihad Airways, which has expressed an interest in taking more control. Mr Goyal, who stepped down as chairman last month, is also thought to have lodged a bid, as have several private equity groups. The outcome of the marathon meeting, which lasted more than six hours – is a huge setback for Jet Airways. The management was confident of securing interim funding that would keep the airline afloat. According to analysts, the airline needs around $3m every day to sustain its operations. Currently, the airline is operating only six aircraft and is flying on very few routes within India. Given the outcome of this meeting, many fear that the airline might not be able to continue for long and may be forced to shut down over the next couple of days. The only ray of hope for Jet Airways is if the lenders can find an investor who will inject money into the company, which will help revive the airline. According to media reports, the lenders have received initial bids from multiple entities including Etihad Airways, which is a minority shareholder in Jet Airways. But the process of finding a strategic investor is expected to take a few weeks. And many worry that without any interim funding it might become very difficult for any potential investor to resurrect the flagging carrier.